Info Congressman Steve King is familiar with justice and the laws of government having grown up in a law enforcement family in Storm Lake, Iowa. He attended Denison Community High School, where he met Marilyn Kelly, whom he married in 1972. The King family set down their roots in southern Sac County on an acreage between Odebolt and Kiron. The King family has lived in Kiron for 38 years and are members of St. Martin's Church in Odebolt. Steve and Marilyn have three grown sons and five grandchildren. King built his business and founded King Construction in 1975; he began his business with one bulldozer, and built it into a company that continues today under the ownership and management of his oldest son. One of the many lessons learned while growing both his family and his business was that government is overreaching, and too often elected officials were unwilling to be a part of the solution. King, finding himself frustrated with the status quo climbed down off his bulldozer and ran for State Senate. 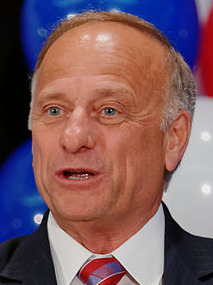 Serving six years in the Iowa Senate, then Senator Steve King served as the Chairman of the State Government Committee and Vice Chairman of the Oversight Budget Committee. A fearless leader in the State Senate he was also a member of the Appropriations Committee, Judiciary Committee, Business and Labor Committee, and the Commerce Committee. King's lifelong work ethic has served him well as a Member of Congress. Elected in 2002 to the U.S. House of Representatives, he spends a tremendous amount of time in the 5th Congressional District engaging his constituents, and has gained national stature as a leading Constitutional Conservative; a frequent contributor to Fox News, national magazines, newspapers and radio. King is well respected among many national conservative leaders as the general on the front lines. Currently, King serves on the House Agriculture, Small Business, and Judiciary Committees. King, a passionate defender of the sanctity of life, remains a national and steadfast voice for the unborn; He also made renewable energy his first priority as a member of Congress. King's legislation provides the small producer tax credit for ethanol companies was signed into law. Another current and important issue to King is his legislation to fully repeal ObamaCare. The full repeal was passed by the U.S. House this session with King's language. King's accomplishments are recognized not only in Iowa but on a national level as a Congressman and a statesman fighting to preserve our Constitution, showing a transparent and consistent pattern of supporting the rule of law and intent to dramatically decrease the size of government. 06/02/2020 IA District 04 - R Primary ?? ?